We are the Resistance. In celebration we create art about female focused themes. Come Rejoice with Us! Cat Wilson is a science illustrator and feminist working out of Tulsa Oklahoma. She contributed to the Lady blog series #LadiesofHorror making suggestions for the 30 Day Horror Movie Challenge. Her favorite post was the two on women of color in Horror Movies, while her favorite movie on the list was The Love Witch. We couldn't have done it with out you. Thank you Angel City Brewery / Art Share LA for the 2017 Queen Calafia Venue Sponsor, Califia Farms, The Venice Love Shack Venue Sponsor 2015 Art of Fashion, Sponsor The Electric Lodge for Persephone and La Sirena Maiden of the Sea & Scoby Baby Venue for our first show! Click here to inquire sponsorship of a pop-up Lady Art Collective Event. Click here to inquire sponsorship of a Lady Art Collective featured Artist. Street walking tour with Lady Founder Marlena, with 10 guests. Tour of Venice Art Galleries and beginner photography skill intro. Special thanks to Skinny Pop Popcorn as our food sponsor. Women love Fashion, to be a walking piece of art and inspire a sense of self expression can be the greatest thrill for many of us. Not everyone is an artist, but everyone wears clothes. For this show, I worked collaborated with Racquel Honroe in creating the show flyer. Guest artist Lizi Ruich displayed her vintage clothing line sketches along with several other artists got to exhibit their works. 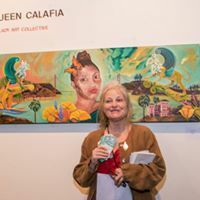 Additional artists that exhibited were Sandi Sharp, Kelly Rose Dancer, Francesca Quintano, Kurisutein Tanagi Lopusnak, Davia King, and Sahra Nquyen. For this show I incorporated many elements. As a child in the 80's I had a real love for the Tom Hank's and Daryl Hannah mythical romance Splash! And 30 years later, still obsessed with turning into a mermaid when my skin touches salt water. For this show I had to go all out. We had a Mermaid Costume Contest, Mermaid Performers in full costume thanks to Professional Mermaid Jennifer Elizabeth , live performances, such as singer song writer Alanna Clarke vendors and artists alike. Some of the artists included Sanaa Khan, Francesca Quintano, Kurisutein Tanagi Lopusnak, Linda Queally, Mariclaire Escobedo, Heather Teran and Lizi Ruich. Performance by Amy Arrow. Vendors, Amanda Wolf designs, Special Thanks to Ecole Claire Folntaine French School as our Sponsor and participating in creating Mermaid made out of Sea Shells created by pre-school aged students. Spring is a time to emerge from the incubation of winter. With all creation stories, there is a story for the seasons. In ancient Greek mythology, lies the tale of Persephone, Daughter of Demeter was stolen by the God of Hell to the Underworld, a land like winter. As a female artist, I look to the symbolism and mythos for inspiration for my art. Artists and vendors include: Constance Brantley, Racquel Honroe, Terry Marks-Tarlow, Heather Robinson Teran, Elise Wehel, Sunny Bak, Marlena E. McClain, Kurisutein Tanagi Lopusnak, Agne Skaringa, Eco Cork, Fahmina's Eco Leather Handbags. Special thanks to Van Lewueen Ice Cream Truck. Performances by Alanna Clarke and Yori Swart.